Summary: Hem, our diesel mechanic, finally returned to finish a couple jobs that Jon wanted done - rebuilding the salt‑water pumps with the correct Yanmar parts and installing our 2 new Jackmaster bypass oil filters. 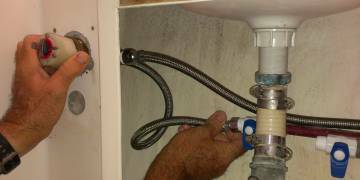 Jon spent a lot of time in the bathrooms, installing the new water mixing‑valves for the sinks and showers. He also repaired an area where water was getting in back at the transoms. Yoong and Baw and Nut sanded virtually all of the deck and cabin‑top, smoothing down the edges of the chipped‑off gelcoat and applying filler where necessary (and being extra careful about cleaning and adhesion). 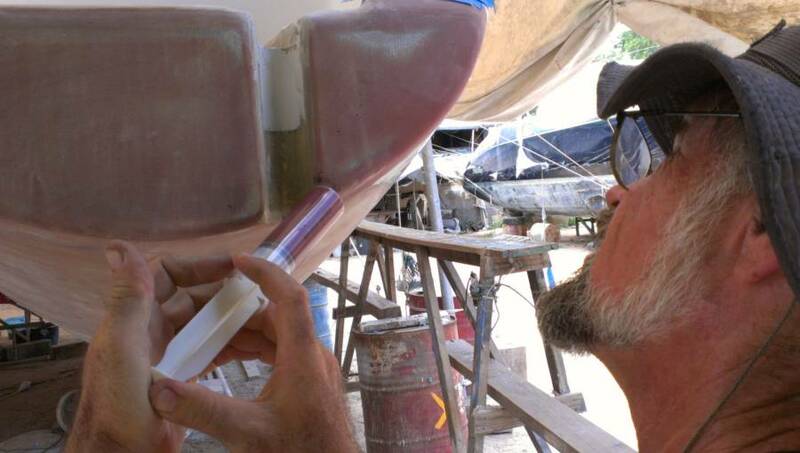 Then they moved on to sanding some of our hatches and cleaning the fo'c's'les and grinding underneath our keels and washing the underwater areas in preparation for the epoxy barrier coats. Phuket Fiberglass delivered 50 liters (13 gallons) of epoxy for that underwater barrier coat. Lek and Pla finished the pinhole repairs and sanded the topsides up to 1500 grit, then they cleaned and painted the undersides of the engine hatches. Sue and Amanda worked on polishing the forebeam and the anchor support beam, and Sue spent a lot of time in the apartment, working on our taxes. We turned the mast on its back and started cleaning up bits of mast hardware. Houa spent the week rebuilding the teak grate that goes over the anchor support beam, between the trampolines. Mike brought a team to prepare the swim‑platforms for gelcoat, and spread some soupy epoxy on to level them out. A good start to the week, as we saw things moving along. Having spent the night in Ao Po with cruising friends, we arrived at the yard after 8:30 and Sue hopped out of the rental car to start the day. Not that anyone needed much direction. Houa spent the day on the teak anchor chain lattice. 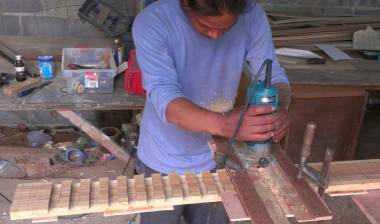 He did a nice job scarfing several pieces of teak together to make them long enough. He also initiated the new Ryobi planer, and since we missed seeing him plane up the 8‑10 rectangular pieces he will use for the lattice, we asked him to run a demonstration piece through the planer. He was very happy to oblige! 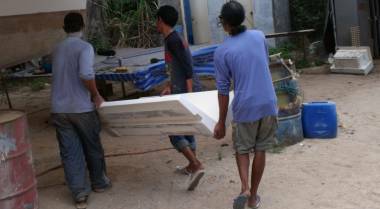 Our diesel mechanic, Hem, arrived with the 2 raw (salt) water pumps for the engines reassembled with the correct parts. He also got some high‑pressure oil hoses to connect up our new Jackmaster bypass oil filters, and he'd taken the rocker covers from both engines and tapped threads into them for the low‑pressure oil‑return lines. By lunchtime he'd mounted the water pump and the oil filter on the starboard engine. 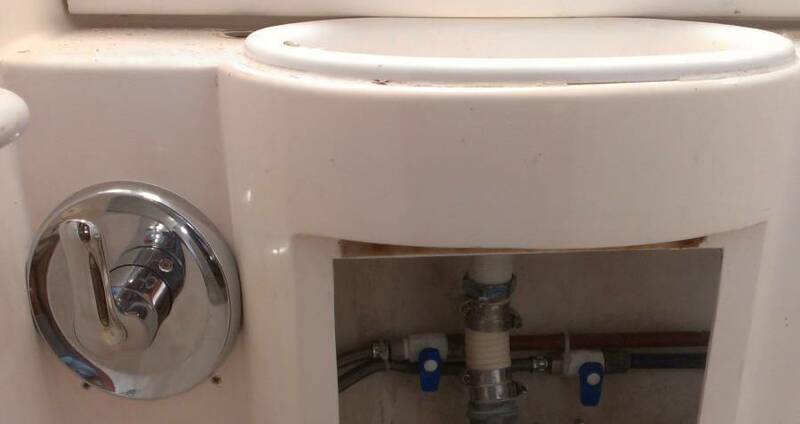 To fit the high‑pressure oil line, he'd removed the oil pressure alarm switch and fitted a T‑fitting to the engine, with the alarm switch on one leg of the T and the high‑pressure hose to the filter on the other leg. Unfortunately, the alarm switch on the port engine broke, so he wasn't able to finish that installation. He'll return tomorrow with a new switch to finish everything off. Up on deck, Yoong and Baw continued with the beautifying of the filler and sanding back the edges of the chipped off gelcoat. They are being very careful to walk only on the vinyl masking, so everything is looking very white and clean. Let's hope it stays that way until gelcoat spray day! Baw estimates they will be done this week, just in time to stop for Songkran (Thai New Year) this weekend for a couple days. Pla finished all the pinholes repairs on the gelcoat (unless he finds more). 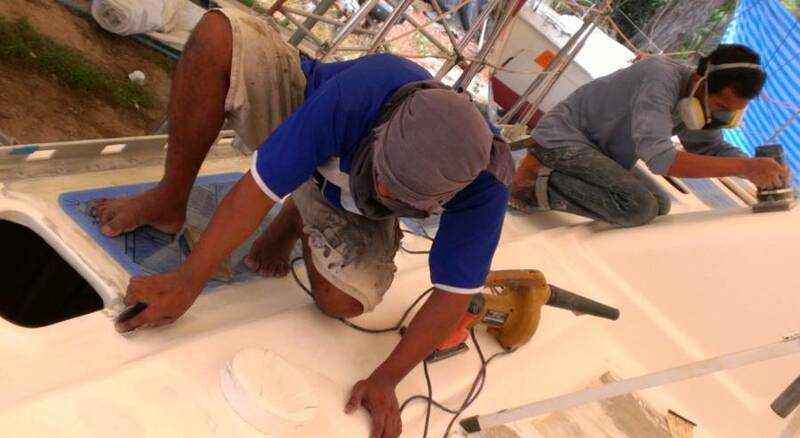 He and Lek spent the day sanding starboard topsides with 1500 grit. This is where they will stop for now. We'll look forward to a big polishing event closer to our splashing time! Jon worked on the interior plumbing some more and discovered that when he had checked the size of our stopcocks for the through‑hulls, he had measured the one odd one (of course)! We had bought all half‑inch stainless steel, and it turns out we only need one half-inch stopcock, and the other 4 are all 3/4" So, after lunch Jon went on Scooter to Boat Lagoon, a good half‑hour north, to peruse the chandleries. 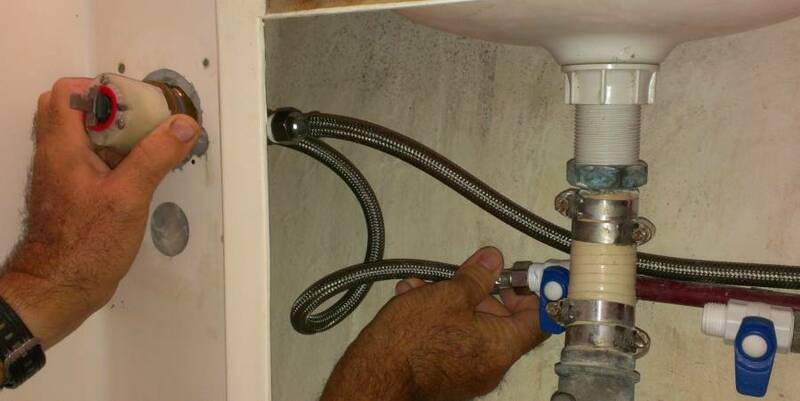 He did find what we need, and chose to buy the 4 sets of fittings in bronze (at $20 each for a valve, elbow, and hose‑barb) instead of stainless steel. Since the actual through‑hull (which we can't easily replace) is bronze, it made sense not to mix our metals. The valve cover-plate had to be trimmed down to fit, but it's in! Amanda and Sue took turns with the grinder, working on both the forebeam (which Amanda is fine polishing) and the anchor support, which needed massive coarse grinding. At the end of the day, they had the latter about 90% finished, at least through the coarse grinding stage. Another hot day at the yard, but at least the rain is holding off. Jon had the hot and sweaty job. He installed the mixing valves in 3 of our 4 heads. There's no breeze down in the hulls and by the end of the day Jon's shirt was absolutely soaked. It would be too easy if everything fit, but of course, it didn't. The faceplates are a smidge too big for the space where the mixing valves go, so each of them had to be carefully sanded down in an iterative process. Small fiddly work in cramped spaces, but it's good to get them finished. Jon only has the port forward valve left to install. Sue stayed in the apartment to do our taxes so Jon and Amanda were holding down the fort. 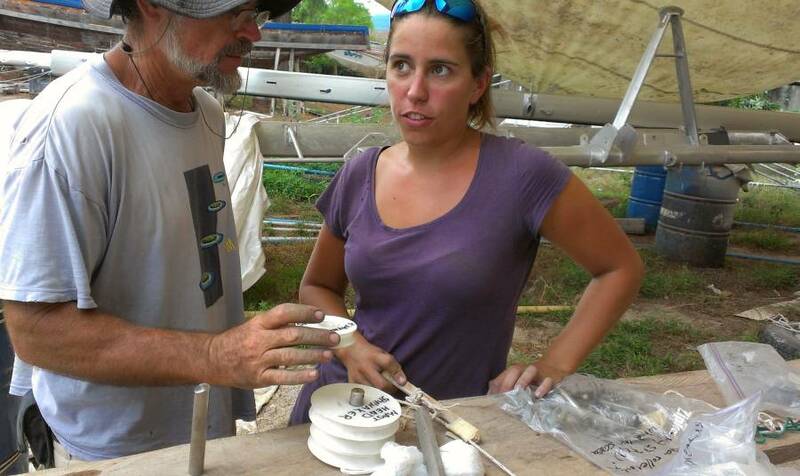 Amanda spent the day polishing the forebeam and the anchor support. She got a lot done while plugged into her music system, but it's hard work. Houa worked on the grate that goes between our trampolines. He looks like he's virtually rebuilding it - cutting bits away and then epoxying more on where he cut it away. He obviously knows what he's doing, and he's tried to explain it to us several times, but the language gap is preventing full understanding. So we stand back and just watch it happening, which is fun in itself. We got Nut back again - not that we asked for him, but Cris, the yard manager, assigned him to us for the day. Nut is actually OK as long as his buddy Bank isn't there as well. Baw and Yoong and Nut worked on the deck and cabin‑top, cleaning small areas thoroughly, applying thin layers of filler where necessary, and then sanding things smooth. We're hoping this work will be finished later this week. Pla and Lek continued their meticulous wet‑sanding of the starboard topsides. We don't want them to get to the polishing stage just yet, but we're running out of things for them to do. We'd hoped that the antiskid would be down by now, as polishing the "gutters" between the sheets of antiskid will take some time, but Mike hasn't even started sticking the antiskid down, and that's a job we don't want to rush. Hem, our mechanic, showed up briefly in the morning to install the oil pressure switch that he'd broken yesterday. Hem strikes us as quietly competent - a good man to have looking after your engines. Mid‑week and things are looking up, or at least, moving forward. And some rain this afternoon, with thunder and lightning. A welcome cooling off to the afternoon, and our tent kept us dry. Baw, Nut and Yoong spent the morning up on the cabin top, and before noon we heard a whoop of joy. They are done! Well, at least done enough to call it quits for now. There will be last minute sanding and cleaning before the gelcoat repair spray, but that's still down the line. Mike is planning to come by tomorrow to check the work and to let us know which of the areas where the gelcoat stuck well (if any) he will re‑spray so that the guys can mask and protect all their hard work. Baw's team moved on to hatch sanding. With Sue's supervision they examined each hatch to see how opaque the gelcoat is. There are a few little repairs (read: re‑spraying) needed but some are ready to be polished up. 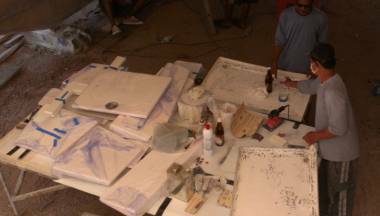 They moved the table under Ocelot and made themselves a nice work space for wet sanding. Houa made some good progress with the anchor chain lattice. He got the last cross pieces chiseled and epoxied into place. While the epoxy was curing he laid out each of the 35 cross lattice pieces, numbered them, and made sure they were all exactly the same. Then he pressed them together (with super‑glued end pieces) and marked where they are to be routered. The actual cutting happens tomorrow, and should be interesting. Sue spent the morning finger sanding and picking at the old paint on both the anchor support and the mast step. This sort of detail work is what Kit was so good at a couple weeks ago, and we sure wish we had her back. Sue is not as patient as Kit, but gave it a good effort. It helped that she hadn't finger‑sanded for more than a month, so her fingers were not yet raw. Well, at least not at the beginning of the day! 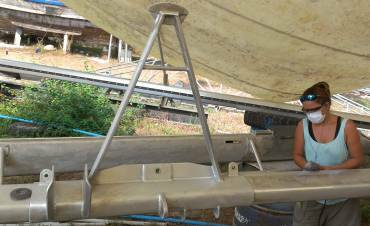 Sue also cleaned out the insides of 2 of the 4 big spreader brackets on the mast. After washing, she wiped the interiors with alcohol and let them dry thoroughly. Then she brushed Nyalic up inside the spreaders. 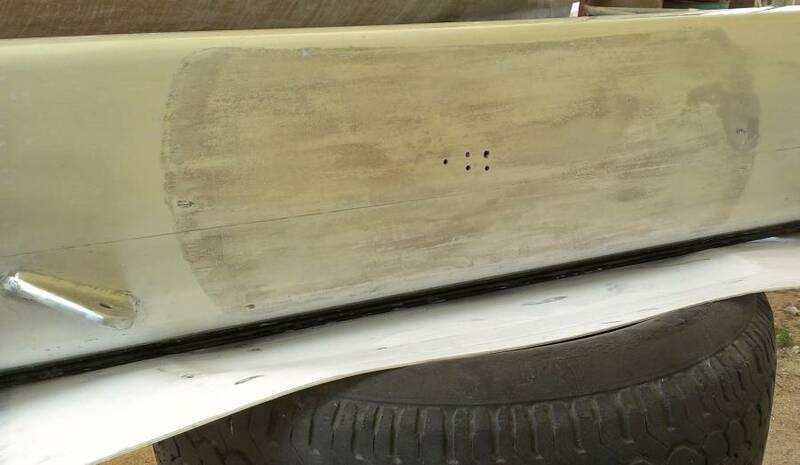 This area can't be seen once the spreaders are inserted, but we hope it helps prevent corrosion inside the mounting. Lek and Pla finished wet sanding the inside aft topsides with 1500 grit. By late afternoon they were back on the last bit of sanding on the starboard topsides on the aft quarter. Pla was clever and used his phone flashlight to locate and then dab gelcoat into a few pinholes on the inner topsides once the light was low from the brewing thunderstorm. Had the full team back at the yard today, although Amanda and Sue spent the morning in Phuket Town dealing with customs, and another 6 month boat extension. Jon was at the yard in time to greet Mike and his team from AME, who set to work sanding, cleaning, and preparing the sugar‑scoops. This was an all day job with 4 guys, plus Mike. It is amazing how great and white and clean the area can look when well prepared. At the end of the day Mike spread another thin layer of epoxy filler on the outer edge of the sugar‑scoops to try and smooth out the high threads of the biaxial cloth we had used to cover the foam. It's not all done yet, but getting closer. Houa had fun with the new planer while working on the anchor chain lattice. But the best part was seeing his meticulous work shaping and routering each small cross piece of the lattice. He demonstrated how the pieces would slot together and it's a true work of art. We are impressed, and looking forward to seeing the final creation. He'll obviously glue it all together, but it looks like it really won't need any glue at all, the pieces fit so well. Baw and his team of Nut and Yoong were under Ocelot all day in the shade (with an electric fan going!) working on the loose hatches. At first we thought they could just polish the good parts and mask off small corners and places where the gelcoat was thin, but when Mike saw them he said to spray them all over. So the guys had to rough up what they sanded smooth. But they were done by day's end, with each piece wrapped in plastic. 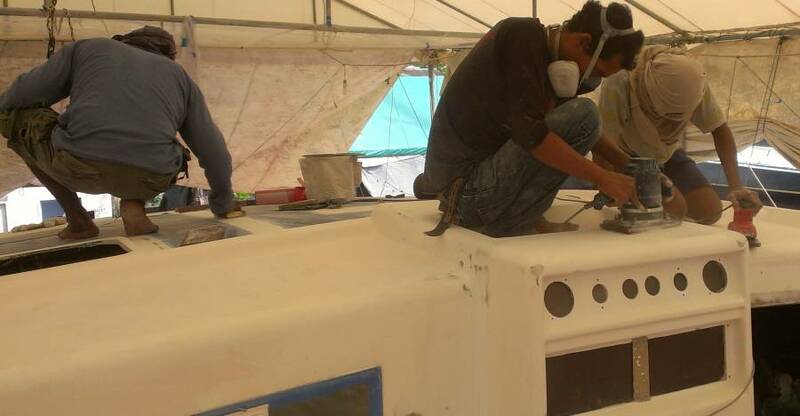 Lek and Pla finished the 1500 grit sanding on the topsides, and all the little gelcoat repairs. Near the end of the day Baw asked us what the team was to work on the next day. Oh, exciting! To be moving ahead with the Great List of Things To Do! We got Yoong, Nut and Baw washing the hull under the water line, in anticipation on finding low spots for filling, and then putting on huge quantities of epoxy resin as a water barrier. We got the mast turned onto its track and 2 of the big spreaders placed in their brackets to support it, in preparation for running the wires and wiring conduit up the mast. Amanda and Jon played with various ways to tie knots to let them both pull up the PVC conduit that will hold the mast wires, and then to be able to release it with a tug so they can pull the ropes out for the next piece of PVC conduit. The mast has been resting on big steel drums with old tires on top, and "future board" (plastic cardboard) between the tires and the mast. After the mast was turned, we realized that where it had rested, the Nyalic gave up and the aluminum was beginning to discolor. Both Sue and Amanda spent time wet sanding those areas back to aluminum, and we'll be able to repair the Nyalic easily this weekend. Re‑reading the Nyalic specs, we realized that perhaps we had turned the mast too soon after coating. Apparently the really hard cure only comes after 30 days! That is probably when Nyalic is finally at its most water‑resistant. We also got out bags of mast hardware and starting going through it. We are missing some sheaves (the rollers that the ropes roll over inside the mast) and possibly some pins. We were shocked when Houa crawled deep into his storage area and pulled out handfuls of pins and plastic washers. He said, "Golf take some of this, some of that" apparently from different boats in the yard. Dang. The Golf nightmare continues. What else will turn up missing? Some of our sheaves are worn so we gave them and one of the anchor rollers to Mike. He'll have AME's workshop make duplicates for us. Tomorrow is a national holiday, and the beginning of Thai New Year, Songkran. Our workers will be taking off both Saturday and Sunday, and maybe Monday, depending on how far away they travel to see their families. Songkran is also known as the festival of water throwing, which lasts up north in Chiang Mai for 2 weeks, but here in Phuket just for 1 day. Apparently the government has recently outlawed throwing water or squirting water at passing motor‑scooters or cars. It certainly was scary last year to see how scooter drivers were being drenched with icy water in their faces while driving at speed on crowded roads. Happy Songkran! Well, officially it's Songkran Eve, but they don't call it that. Tomorrow is the Thai New Year, and a day of water throwing, visiting family, and the biggest holiday of the year. Our guys will be gone for 2‑3 days, and today felt like the holidays were beginning already. Ocelot's hulls are fiberglass and polyester resin. Polyester can absorb water over time, so we need to put on a barrier coat of epoxy under the waterline (epoxy is much less water permeable than polyester). The manuals say we need half a millimeter (.020") of epoxy to provide an effective barrier coat. This means we'll need 9 liters (10 quarts) for each half of each hull, so 36 liters (10 US gallons) total. 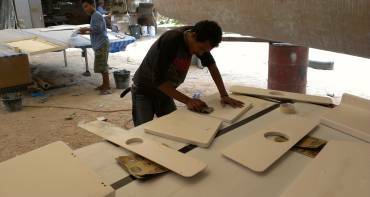 With such a large purchase, we asked Cris, the yard manager, to negotiate a good price for us and he did - Phuket Fiberglass gave us a good price and even delivered it, which was nice. As expected for Songkran, it was hot, hot and hotter today, and Baw's Team of 4 probably enjoyed spending the morning washing down Ocelot's hulls, under the waterline. But cleaning the hulls didn't take the guys very long, so they moved on to other small jobs. Baw, with Yoong holding the blower, lay on the ground and ground away years of anti‑fouling paint from under the keels. How this wasn't taken off last year we can't imagine. To us, a haul‑out is time to sand and replace or clean‑up the antifouling -- all over the hull, including under the keels. Maybe there was an "out of sight, out of mind" attitude going on. Lek and Pla worked on cleaning up the under‑sides of the engine hatches, ending with really gnarly thinners. 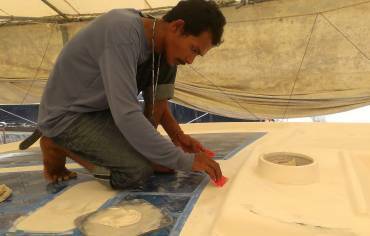 Then Pla mixed up our Nippon 2‑part epoxy paint (a hand‑me‑down from other yachties who swear by it) and rolled on several layers, wet‑on‑wet, of this very well‑covering white paint. It's not picture perfect, but it's really just to protect the insides of the hatches and give them a new look. Jon cut off the old drain pipes in the battery compartment that used to drain directly to the cockpit floor - A rather ugly, messy solution. Instead, we'll install proper drains down to the insides of our wave‑breakers under the bridge‑deck, but we wanted the holes, where it drains onto the cockpit floor, to be filled. One of them was filled months ago because we had some bad balsa there, but the other one never got filled. Jon showed Baw what filler we still needed up in the cockpit. We wanted it done today, so that we don't squeeze up against Mike's spraying time next week. Baw designated Nut for the job, so he spent the afternoon sanding, cleaning with acetone, and filling several small dings in the locker rims, up against which the teak will go. Unfortunately, he missed the instruction to fill the old battery locker drain hole, so that will have to be done on Monday. Houa worked his carpenter magic on the lattice teak pieces, laying them all out and routering half‑way through them at carefully designated intervals. He's built several small tools to make sure that all his cuts are exactly where they need to be. The thing is going to fit together like a Rubric's cube! Amanda got the last of the wrecked Nyalic on the side of the mast sanded off, so, weather (and energy) permitting, we hope to get that repaired this weekend. Sue also spent time sanding, but it was grueling finger‑sanding with heavy grits like 60 and 100, trying to fair in the aluminum between brackets where the grinder doesn't fit. By mid‑afternoon Baw was asking us what there was to do, so we hauled out our short list of worker jobs. Lek opted to sand the undersides of the helm seat, a job that has fallen by the wayside along with all the small removable hatches. We want everything ready for gelcoating when Mike is ready. Baw and Yoong attacked the cleaning of the fo'c's'les and the anchor and chain lockers. They took a hose in and had fun doing mindless work on the day before the big holiday. Some days ago we discovered some water weeping out of our starboard transom. We have no idea where this water came from, or how it got to the transom, which should be covered in several layers of epoxy glass. But we drilled a hole where the water was weeping out, so the area could dry out. We also drilled a couple more holes in the bottom of the sugar‑scoop, under the waterline, trying to find out if we've got a puddle of water somewhere. We never found a puddle, but we wicked out as much water as we could by stuffing rags up the weeping hole, and blew hot air into into it to dry it out as much as possible. After drying the area for several days we filled a big syringe with 60cc of phenolic filler, wrapped the tip of the syringe in tape so it was a tight fit into the hole, and injected the phenolic filler into the hole. 60cc is a lot of resin, and it was hard to pump in, so we're sure it blocked up whatever nooks and crannies the water was using. Then we wetted out some fiberglass cloth with epoxy, rolled it into tight cylinders, and twisted them up into the 3 holes we'd drilled. 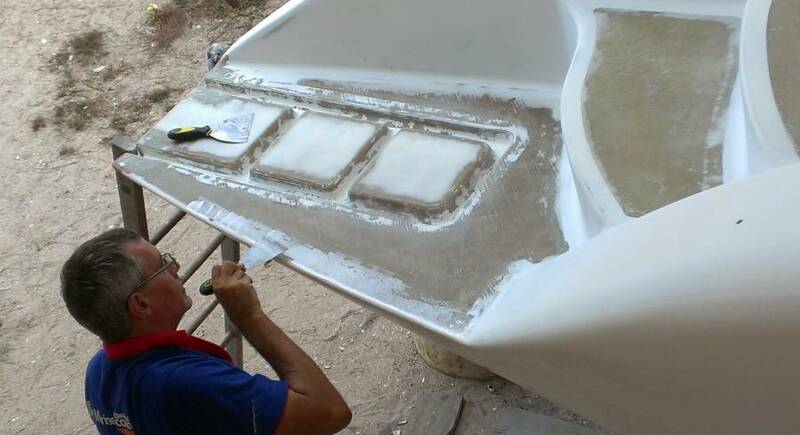 When the epoxy cures, we'll cut off what's still sticking out of the hull, sand it back, put a couple of fiberglass patches over where the holes were, and fair it all in smoothly. Everything is closing down for the weekend and into early next week, so we had to think ahead for what we'll need. Amanda went out on several hardware store runs for sandpaper and grinding wheels, and then to the bank with Sue. Pay day and all that. We ended the day with peanuts and nori‑crackers, beer and sodas. Happy Songkran, everyone!